Today I got to go the bike store with S. and pick out a brand new shiny bicycle. I rode down to meet her at the cafe and then we hopped in her car and went and test rode and purchased a most beautiful red bicycle. I drove and she rode and we made it back to her place at almost the exact some time. It doesn’t make that much longer to ride a bike, she said. No, no it doesn’t, my friend. I hope she loves that bike and rides the heck out of it in whatever ways will make her happy. We walked through the Quarter, me pushing my bike, she holding her dog, to pick up dinner, weaving among the early evening’s ghost tours. The guides were wearing their goth uniforms and carrying their gnarled walking sticks, telling stories that I didn’t want to hear. Then I headed to the theater to sell drinks in exchange for a seat to a play–another ghost story. 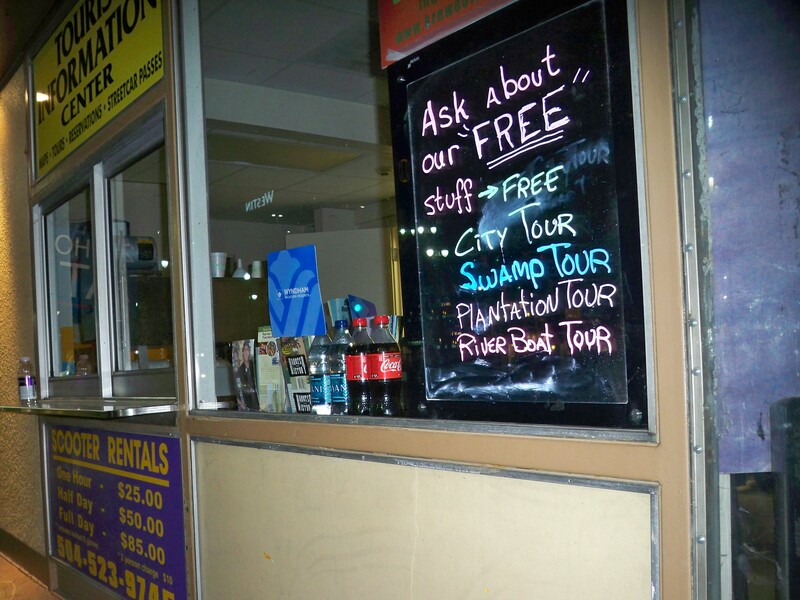 I stopped on Canal to get a snack and snapped a picture of this scooter rental place, offering a bunch of tours of places surely filled with ghosts–city, swamp, plantation, riverboat. I rode home up Tchoupitoulas, thinking of how many ways people have organized their lives around what happens on the wharf on the other side of the wall on Tchoup, how many kinds of ghosts might linger there. Yep, Halloween is on the air. This entry was posted in bikes, history, holidays and tagged Afterlife: A Ghost Story, French Quarter, New Orleans, Southern Repertory Theater. Bookmark the permalink. i f’n love the new bike! thanks again for being our justice of the piece. Now that is one cute bike.